I love this salad, it has become one of those easy quick fix meals when there’s not much in the fridge. It’s super healthy, full of protein and tastes great. Don’t hesitate to add left-overs. Cut the tomatoes into small pieces and the shallots or spring onions into small slices. 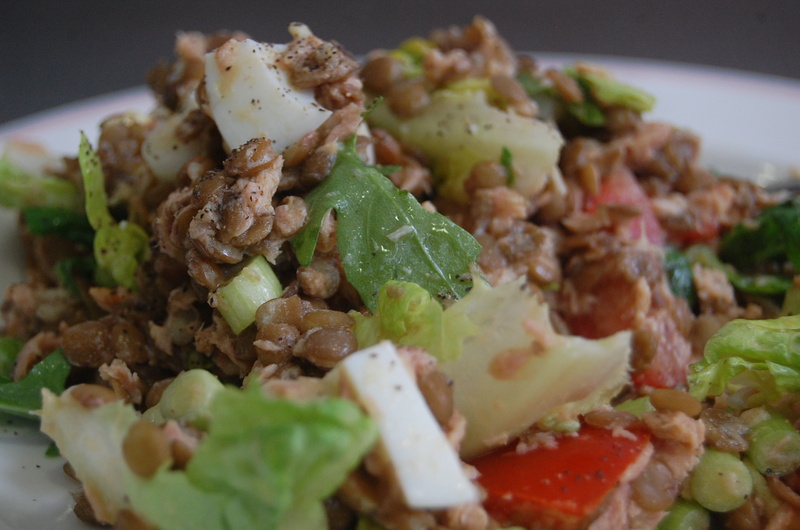 Rinse the lentils and put them in a bowl along with the tuna, chopped tomatoes and sliced shallots/ spring onions and cut eggs. Add some chilli flakes, as much or as little depending on taste. Add 1 tbsp of vinegar and 2 tbsp of olive oil and add salt and pepper. Mix everything together and add some vinegar and olive oil depending on taste. Ah great! Happy you enjoyed it!